As a person who is invested in personal growth, I am always reading and on the lookout for areas within myself that I can work on, improve or change. My belief is if we are not growing and learning then we essentially just exist. Where is the fun in that? You can believe this or not, your choice, however I find this one area I am playing with now (growing can be fun too) is something most everyone could potentially benefit from. I am asking you to challenge yourself and test my theory to see if the process I am going to suggest here creates some improvement in your life via your interactions with people and your overall feelings of wellbeing, even if just slightly. Based on the chosen quote above you are probably guessing it has something to do with words. Yes, indeed it does. For a trial period ask yourself the following questions before you speak and if the answer to each of the following three questions is not a resounding YES then you say nothing at all. I mean really true, and can be proven without much doubt. Is factual, not made up? Is not a judgement based on your perspective? Remember, what may be true for you may not be true for someone else, so this needs to be considered as well. I am sure you get the gist. Let’s be honest with ourselves here, we all say nasty stuff at times that is not kind. We either say it behind people’s backs or to their face if pushed. No one is perfect in this regard, although some are better than others. However, words can hurt and damage relationships. They can’t be taken back once uttered and hurtful words really do not serve any purpose other than to stroke our inflated and wounded egos. If you are not sure if what you are about to say is kind, then err on the side of caution. 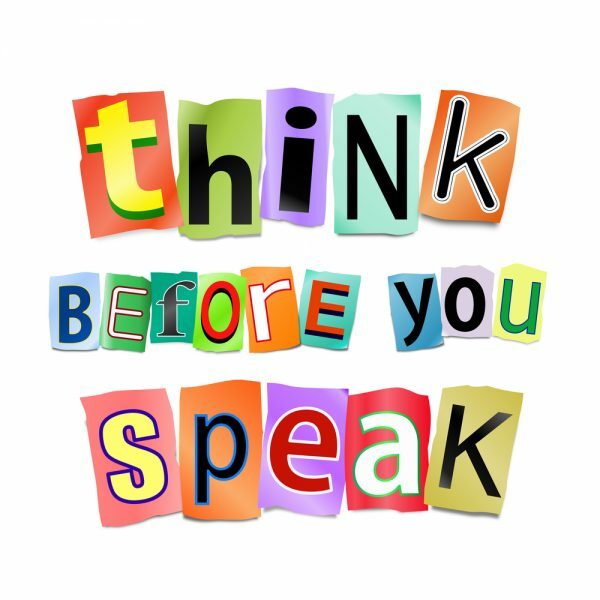 If our words are meant to hurt someone, degrade someone either directly or indirectly by hurting their reputation then the answer is NO. So, you have passed the first two questions: you know it’s true and you know it’s kind. You are now faced with the test question of, “Is it necessary?” This is where things can get tricky, and where we can tend to say things that probably could have been left unsaid. If left in a dilemma at this point you can always apply an acid test. Will what you are about to say enhance the conversation, enhance the person or people’s lives, or provide valuable information the person or people need to hear for their own benefit? If we deem it necessary based on our own personal need to change someone, fix someone, provide unsolicited advice, or our incessant need to be right and get the last word in then the answer is most likely NO. Gossip would rarely if ever pass this test with a YES, YES, YES! So, if you are a person who gossips or a closet gossiper this may be a real challenge for you. If you don’t think you gossip and you are diligent about trying this challenge out, you may gain some insight or truth by how little you must talk about and find yourself silent a lot. I will be honest this does take practice and you will mess up at times. When you do mess up start over, and just keep practicing. You will have to stop and ask yourself the questions in your head for sure. But after time it will become quicker, easier and more of a pleasant habit of sorts. Up for the challenge? What could result from this new habit? You may feel more peaceful, your relationships may improve, you may feel more loving and kind in general, and you may find conversations or people that used to attract you no longer feel good to be in or around. You may be seen differently in a positive way and attract more joy into your life. It is my belief that only good could come from this way of speaking, emotionally, spiritually and physically. At a minimum start with one day, then try for two, hell, why not go for an entire week if you are up for the challenge. I am sure some people may be thinking… “Not sure I can even do this for one hour, yikes!” Well, try it anyway. Note, if one of your mess-ups does in fact inflict hurt, do apologize, forgive yourself and keep on trying. May the force be with you, enjoy the challenge and have fun with it. Life is far too short for beating ourselves up for trying to improve ourselves, our life or our relationships.